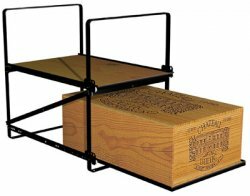 EuroCave Roll Out Racks are a unique system for storing your wines in their original wood cases thanks to an innovative sliding tray system. Based on the same principle as the sliding trays in the wine cabinets, Modulorack has an exclusive system of sliding trays in which to arrange the cases of wine. Each Modulorack is designed to support 2 cases of 12 750mL "Bordeaux" bottles. The Modulorack is attached to the ground and the wall. Several Moduloracks can be arranged together to increase your storage capacity while still guaranteeing total stability when handling the bottles. Please note, this is a heavy rack, hence the higher delivery rate! The more you order, the delivery rate becomes cheaper.